A growing repository of primary documents obtained under the Freedom of Information Act and from other sources. 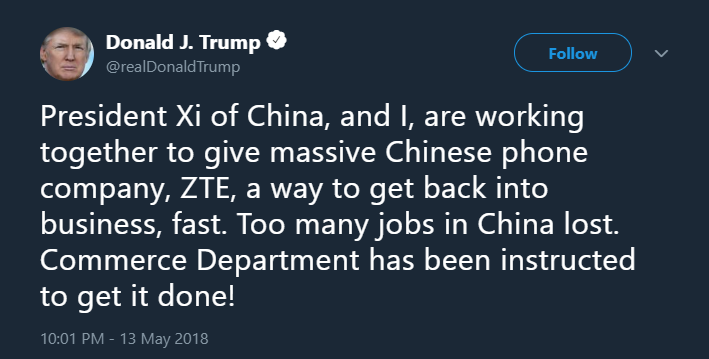 On May 13, President Trump announced on Twitter that he was working with President Xi Jinping of China to assist the Chinese telecommunications company ZTE. This announcement surprised many in the national security community as the US Government has in the past claimed that devices made by ZTE, as well as other Chinese telecom firms such as Huawei, are used by the Chinese Government to conduct surveillance. This week’s Cyber Brief adds to the Cyber Vault an investigation into Huawei and ZTE published by members of the House Permanent Select Committee on Intelligence, a report by the US-China Economic and Security Review Commission on China’s telecom sector, a 2011 DoD report on China including information on China’s cyber capabilities and technical development, and a bill introduced in the House earlier this year which would ban Federal agencies from using ZTE and Huawei goods and services. The Brief also highlights a collection of documents from the Vault concerning China’s broader capabilities in cyberspace. Bryan Krekel, Northrop Grumman, Capability of the People's Republic of China to Conduct Cyber Warfare and Computer Network Exploitation, October 9, 2009. Unclassified. This study, prepared for the U.S.-China Economic and Security Review Commission, focuses largely on Chinese computer network exploitation (CNE) as a strategic intelligence collection tool. It examines Chinese CNE operations strategy and operations during conflict, key entities in Chinese computer network operations, cyber-espionage, an operational profile of an advanced cyber intrusion, and a chronology of alleged Chinese computer network exploitation events. Bryan Krekel, Patton Adams, George Bakos, Northrup Grumman, Occupying the Information High Ground: Chinese Capabilities for Computer Network Espionage and Cyber Espionage, March 7, 2012. Unclassified. This report, prepared for the U.S.-China Economic and Security Review Commission, focuses on six topics: information warfare strategy, Chinese use of network warfare against the United States, key entities and institutions supporting Chinese computer network operations (the Third and Fourth Departments of the Peoples Liberation Army's General Staff Department), potential risks to the U.S. telecommunications supply chain, the comparison between criminal and state-sponsored network exploitation, and the risks and reality of collaboration between U.S. and Chinese information security firms. Colonel Jayson M. Spade, U.S. Army War College, Information as Power: China's Cyber Power and America's National Security, May 2012. Unclassified. This research paper examines the growth of Chinese cyber capabilities - including those for offensive, defensive, and computer network exploitation operations. It also compares China's capacity and potential in cyberspace to United States efforts with regard to cybersecurity. In addition, the author suggests a number of steps to improve U.S. cybersecurity policy. Threat Connect, Camera Shy: Closing the Aperture on China's Unit 78020, 2015. Not classified. This private sector study of a Chinese cyber intelligence unit examines the techniques employed, targets throughout Southeast Asia, and the unit's focus on the South China Sea, "where China's increasingly aggressive assertion of its territorial claims has been accompanied by high-tempo intelligence gathering."